Suguru N. Kudoh received his Master‘s degree in Biophysical Engineering (1995) and PhD from the Osaka university, Japan (1998). 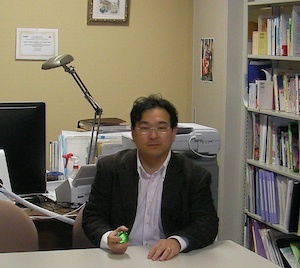 He was a research fellow of JST(Japan science and technology agency) from 1997 to 1998, and a research scientist of National Institute of Advanced Industrial Science and Technology (AIST) from 1998 to 2009. Now he is an associate professor at Kwansei Gakuin university. The aim of his research is to elucidate relationship between dynamics of neuronal network and brain information processing. He analyses spatio-temporal pattern of electrical activity in rat hippocampal cells cultured on multi-electrode arrays or acute slice of basal ganglia . He is also developing Bio-robotics hybrid system in which a living neuronal network is connected to a robot body via control rules, corresponding to agenetically provided interfaces between a brain and a peripheral system. He believes that mind emerges from fluctuation of dynamics in hierarchized interactions between cells. Master of Engineering, Osaka University. Doctor of science, Osaka University. Research fellow, JapanSociety for the Promotion of Science. Research fellow, Japan Science and Technology Corporation. Research Stuff (three-year term), Osaka National Research Institute (ONRI). Research Stuff, National Institute of Advanced Industrial Science and Technology (AIST). Research fellow (additional post), Precursory Research for Embryonic Science and Technology,　Japan Science and Technology Corporation.